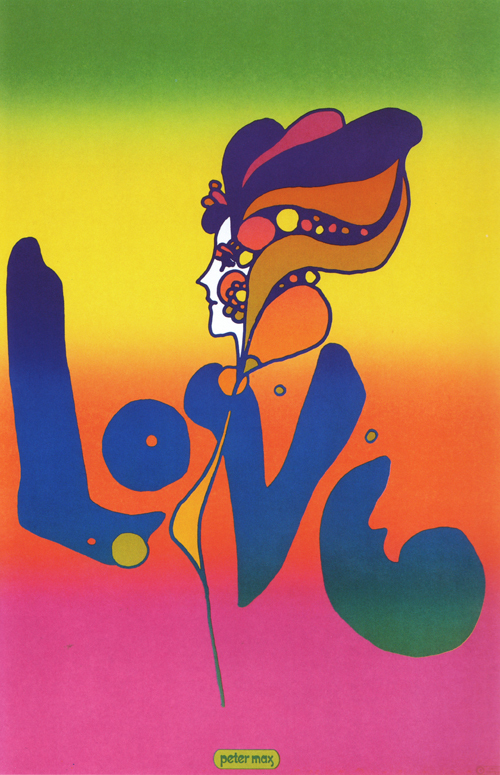 Peter Max (1937-) was one of the first 'poster artists' whose work I became aware of. 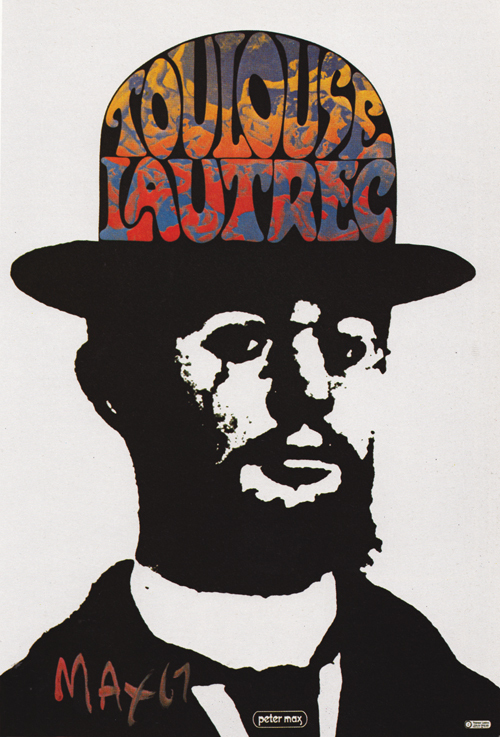 This is in thanks to him being one of the few artists to have a full colour plate within John Barnicoat's Posters (A Concise History) - Thames and Hudson (1988), and that being the first design book I owned. Max was born in Nazi Germany, from which his Jewish parents fled with him to Shanghai, then to Israel, then to Paris, before finally settling in New York in the early 1950s. He completed formal art studies at the Art Students League of New York, after which he set up an art studio in Manhattan with friends, working on books and advertising. Max continue to works, apparently he's the official artist for such major US events as Grammy Awards, Rock and Roll Hall of Fame & The Super Bowl. He also runs an annual colouring competition. 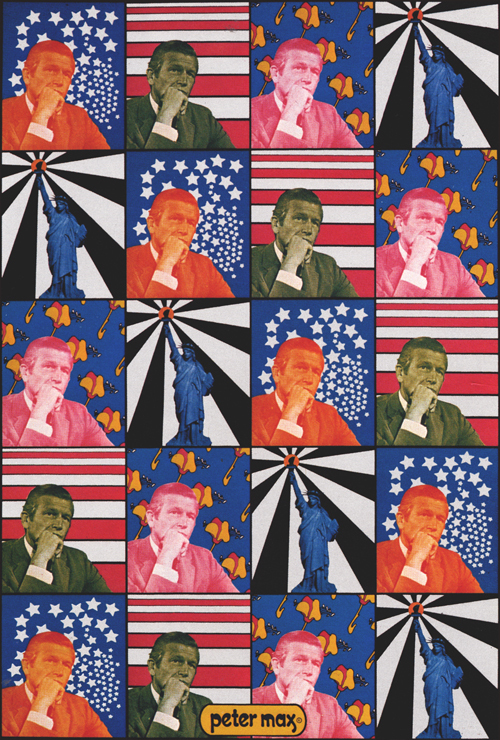 Along with Milton Glaser, Peter Max is one of my favourite American graphic artists of the late 60s & early 70s. More about Milton another time. 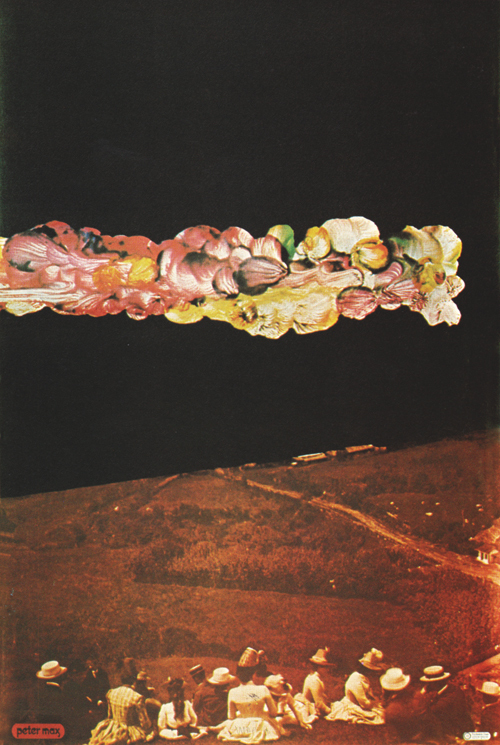 Here, I'm going to focus on Max's work produced between 1967-1974, because it's the work reproduced during then, and that I've reproduced above (and below), that grabbed my imagination in the late 80s. While Wes Wilson and Victor Moscoso's psychedelic poster art are perhaps a more systematic indictment of the copious amounts of LSD some artists were taking, their work is more of a texture, and as wonderful as it is, it is still borderline confusion. On the other hand, I like Max's slightly tamed, more concise take on the cunter-culture, it's almost modernist in it's simplicity, sparseness and drama (despite being not at the same time). And like much of the pop-culture of the time, it makes interesting nods to Victoriana art, fashion & design. 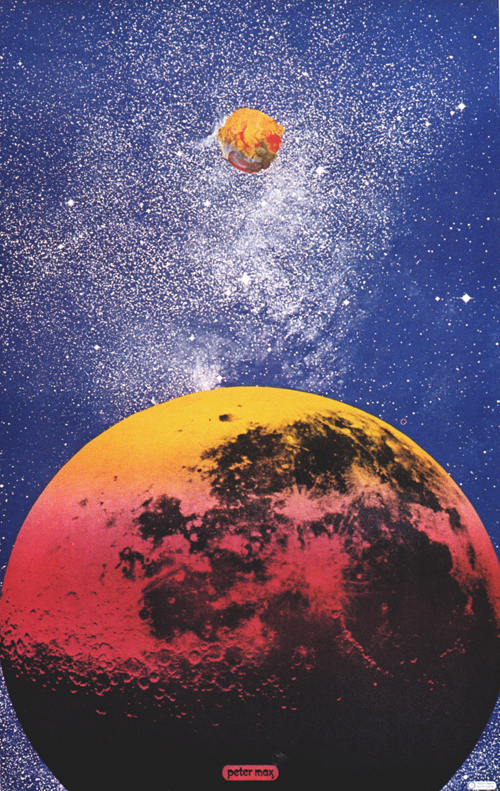 Peter Max, was perhaps the cosmic son of the Beggarstaff Brothers. 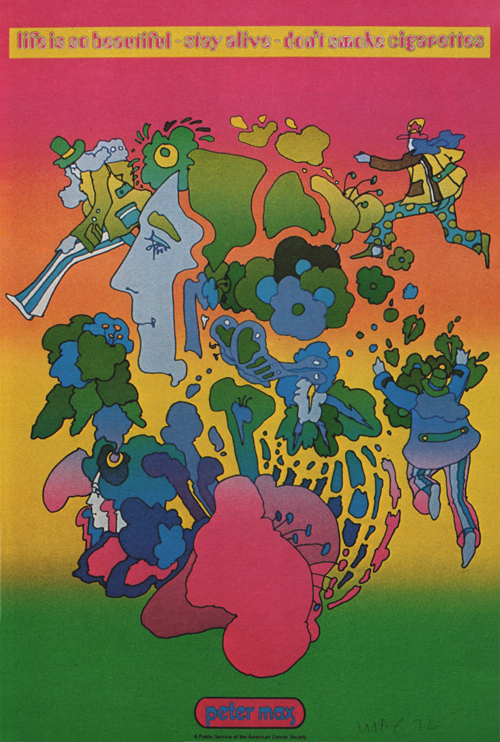 Various pieces of Max's work bare a resemblance to Heinz Edelmann art direction of The Beatles' Yellow Submarine film (1968), and I used to think that the cover of Love's Forever Changes was his work too (it's Bob Pepper). I have no idea who was borrowing who's style in this regard, but neither do I care. I'm just glad quirky graphics like this exists at all. 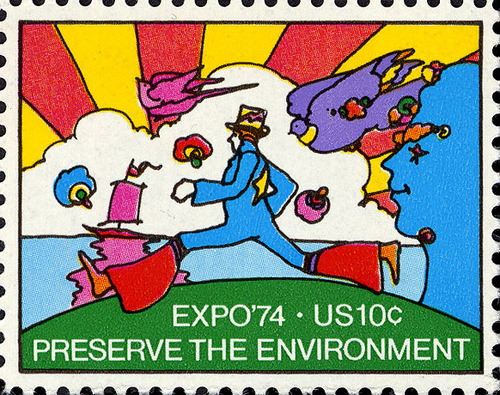 I guess on some levels, signatures of Max's work and style have become the currency for the lazy designers (and advertisers) to steal, a lifestyle shorthand for capturing the late hippy 60s counter-culture, without any interest or care for the politics. His 'LOVE' poster is as culturally abused as the 'KEEP CALM & CARRY ON' poster. A wall print, for people who don't do drugs. And perhaps Max can be held indirectly responsible for many 70s 'cosmic' prog record covers too, and ultimately, further down the line, for Roger Dean. But I don't think you should let these thoughts devalue his poster work, it has an energy, simplicity and excitement that is pretty rare and unique. The reproductions below are from my copy of Images of an Era: the American Poster 1945-75 by the National Collection of Fine Arts, Smithsonian Institute. This is a book that is sadly out of print, but it remains an exceptional education in American 1945-1975 graphic posters. It's big. It's all in colour. And it's very thick. Thoroughly recommended.